P. Por sosodé ku e kuentanan di koló di e armbant ta kibra. Ki konsekuensia esei por tin pa e usuario? K. Si e kuentanan di koló kibra por usa otro kuenta di bo smak pa bolbe kompletá e armbant. Pues por kambia e kuentanan di koló sin problema. Ta e serámika krèm ta perkurá pa e aktividat regenerativo di e anti-oksidante. Q. What are the consequences if the colored beads of the bracelets break down? A. 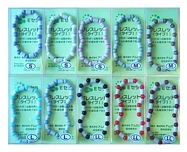 You can just replace the colored beads with beads of your own choice. It is the ceramic beige colored beads that are regenerative active. P. Kuantu tempu e pipanan di serámika mester para den awa pa revitalisá e awa? K. Asina e pipanan bini den kontakto ku e awa e informashon regenerativo ta pasa pa e awa i kambia e struktura. Mas e ta den kontakto ku e awa mas efektivo e proseso ta. Q. For how long should the ceramic pipes be in contact with the water for the revitalizing process to be effective? A. As soon as the ceramic pipes make contact with the water the information will be transferred, and the water will be revitalized. The more contact the more effective. P. Ta nesesario pa usa un felter riba nos pipa di awa na kas ora nos ta purifiká nos awa ku EM serámika? K. Nos ta rekomendá tur hende usa felter pa purifiká nan awa. E felter ta filtra e sushi ku tin den e pipanan. Pone e pipanan di EM serámika meimei den e elemento pa revitalisá e awa dor di saka tur loke ta kímiko ku no ta pertenesé na e awa. Kontrolá e felter(nan) regular i kambia e elemento na tempu. Q. Is it necessary to install a water filter at home to purify the water when using EM ceramic pipes? A. We recommend using a water filter for water purification. This filter purifies the coarse debris in the pipeline. Put ceramic pipes in the filter to remove all the chemicals in the water. Inspect the water filter(s) regularly and replace the cartridge if necessary.